Evie, 11, has been working hard to have a statue of Mary Anning erected in Lyme Regis. Mary Anning was a palaeontologist in the 19th Century. She hunted fossils and made lots of important discoveries that have shaped the way we think about prehistoric times. As a woman in the Victorian times from a poor family, Mary didn't get credit and recognition for the work that she did during her lifetime. Now, Evie is trying to change that. She is on a mission to have Mary remembered by honouring her with a statue in her home town. Read on to find out more about Mary Anning and Evie's amazing journey to have her remembered. We also want to know the amazing women in history who have inspired you. Let us know in the comments below! Mary Anning was born into a poor family on 21 May 1799 in the English seaside town of Lyme Regis. She spent a lot of her childhood hunting for fossils on beaches in the area with her father and brother, and they sold what they found to try to make money. She called them 'curiosities' before she learnt more about exactly what fossils were - the remains of ancient creatures, which are now hidden in the rocks under our feet. In places where ancient layers of rock are exposed, like on cliff faces, they can be found. Her father taught her everything he knew about fossils. When he tragically passed away, Mary continued with his fossiling work. One day, her brother spotted an unusual skull in the cliffs. At just 12 years old, Mary chipped away to find the rest of the fossilised bones and dug them out. 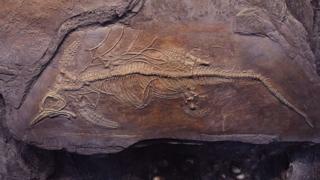 She didn't know at the time, but Mary had just found the first skeleton of an ichthyosaur (which means 'fish lizard'). It would provide evidence for the theory of the extinction of dinosaurs, so it was incredibly important. She went on to make many more important discoveries, including the first plesiosaur skeleton at the age of 22. As a poor Victorian woman, though, she never received the recognition she deserved for the amazing work that she did. It was only after her death in 1846, at the age of 47, that the Geological Society of London made her an honorary member. Today, she is remembered as one of the greatest fossil hunters that has ever lived. Evie, 11, is a keen fossil hunter who loves the story of Mary Anning and all that she achieved. One day, she was fossiling with her mum and asked to go to visit the statue of Mary Anning. She was shocked to discover that there wasn't one. "I couldn't understand," says Evie. Evie got in touch with the local council, who agreed that there should be one. Now, an artist has been chosen for the project - a sculptor called Hazel Reeves, who recently made a statue of Emmeline Pankhurst, which you can see in St Peter's Square in Manchester. "We need justice for Mary," says Hazel. "She really needs to be recognised as an amazing woman. People are beginning to understand that there were many women over history whose names haven't been in the history books - and Mary is one of those. "I think it's outrageous, really, that Mary doesn't have a statue in Lyme Regis, in the area where she worked all her life! I think we need to right that wrong." According to The Public Monuments and Sculpture Association, about one in five statues in the UK are of women, but many of these are nameless or mythical. "It's important that there are statues of women that young women can look to as role models, be inspired by and see that they can do anything they want to do," explains Hazel. "Girls and women are amazing. Sometimes you just have to dig up their stories!" Hazel is currently doing research to help her to design the Mary Anning statue. WATCH: What do you think Mary Anning's statue should be like? Once the design has been decided on, the next stage will be for Hazel to create a smaller version of the statue. Then, a larger mould will be created before the final statue is cast in bronze and coloured. It has not been confirmed where in Lyme Regis the statue will be erected. But once it is in place, the people of Lyme Regis will finally have a lasting tribute to their amazing fossil hunter. "I think that if Mary Anning knew that we were getting a statue for her, she would be very happy and pleased," says Evie. "Seeing this project comes to life makes me very happy because I didn't know that an 11-year-old could do something like this." WATCH: Your pictures - What should the statue of Mary Anning look like? International Women's Day: Who inspires you? You are amazing - keep on fighting for justice! @Hope, me too! I did a WHOLE project on her and Lyme Regis! We also learnt about ricks and fossils! So inspirational! Mary Anning was truly a remarkable woman and she changed the world and scientists views on extinction and fossilisation today. Building a statue to commemorate her is amazing and Newsround are amazing for helping to raise awareness on these strong women who have done so much for us and for our lives to be what they are today. I have to admit that I had never heard of her; however, I have heard of a number of male palaeontologists from school. It is rather infuriating when we are only taught about men, if they are in stereotypically male roles!! BTW I Want to cry from The Animation of `Who was Mary Anning? ` Clip! I did Mary Anning For my Project once!